Preheat the oven to 425 degrees F. Break off the woody ends of the asparagus. Toss the asparagus, 2 tablespoons olive oil, about 1 teaspoon salt, and 1/2 teaspoon pepper (or to taste) together on a large sheet pan. Bake in the oven for 12-17 minutes (depending on the asparagus thickness), flipping the spears once halfway into the cooking time. Remove and squeeze 1 tablespoon lemon juice over the spears. Allow to cool and chop into 2-inch pieces. Meanwhile, prepare the packaged couscous according to package directions. Allow to cool. While the asparagus is cooking, prepare the dressing. Pour the vinegar in a small saucepan over medium heat. Bring to a boil and reduce until the vinegar is halved (about 1 and 1/2 tablespoons). Allow to slightly cool and toss with the remaining 2 tablespoons olive oil, minced garlic, dijon mustard, and honey. Briskly whisk and season with salt and pepper (about 1/2 teaspoon salt and 1/4 teaspoon pepper, or to taste). 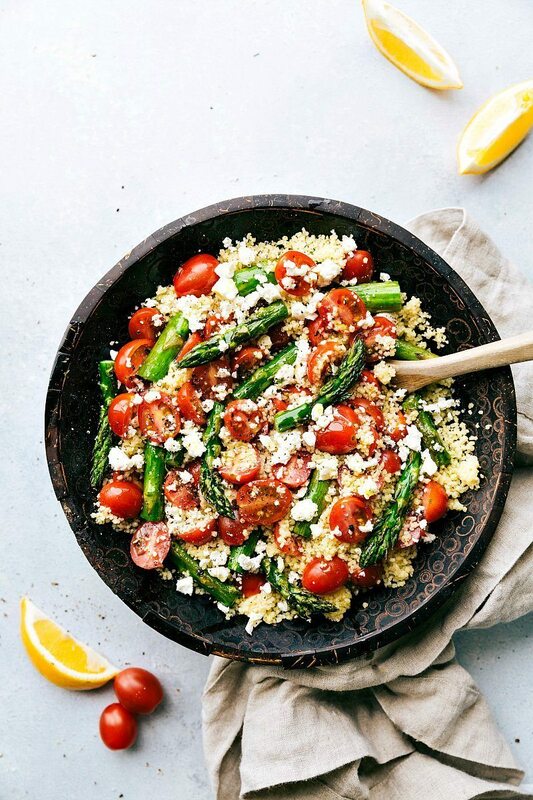 Add the cooled couscous, cooled chopped asparagus, and cherry tomatoes to a large bowl. Lightly toss. Add dressing to taste and another fresh squeeze of lemon if desired. Lightly toss again and then top with the crumbled feta cheese. Enjoy immediately. If you don't plan on eating all of the salad, only dress what you will eat (this salad doesn't sit well with the dressing for an extended time).